Saving money on shipping supplies is good. Saving money everyday without gimmicks or restrictions is better. At eSupplyStore.com, we pride ourselves on stocking the widest selection of top quality shipping materials, supplies and accessories at everyday low prices that you can count on to squeeze into your budget. Back that up with same day shipping and a customer service team that always provides quick, easy solutions. If you're looking for insulated shipping coolers for moving heat-sensitive materials, we've got the size and style you need. With their molded foam shell, they not only keep your products cool, but resists impact and crushing during shipment. Select the size and quantity your business needs from the cooler inventory below, and if you need any assistance during your visit, we welcome your call at 866-437-8775. 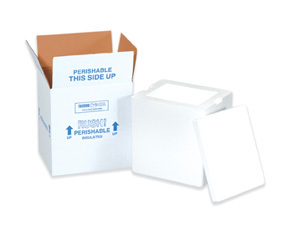 Thick molded foam container protects contents from crushing and breakage.